Bamboo House is a single-storey home that spans 1,938 square feet (180 square metres), with just the bedrooms and bathrooms fully enclosed and protected from the elements. 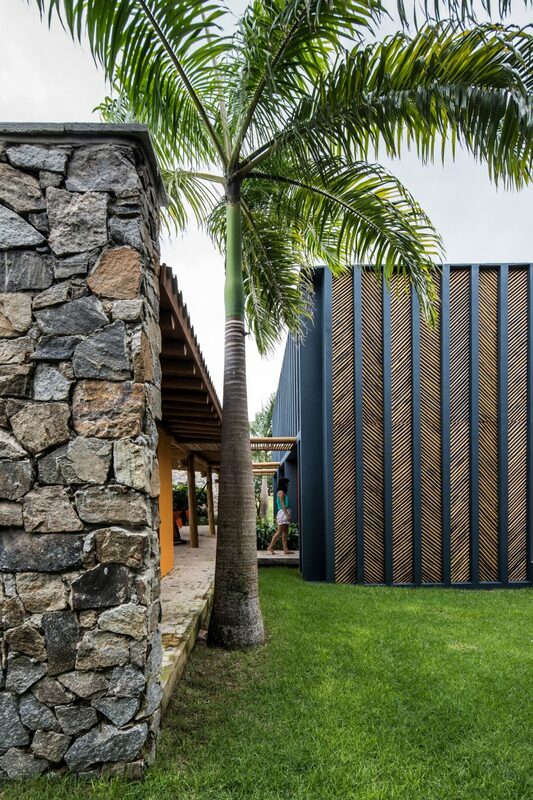 The residence was designed by Vilela Florez in Pipa Beach, Brazil, for a couple and their sons who occasionally visit. 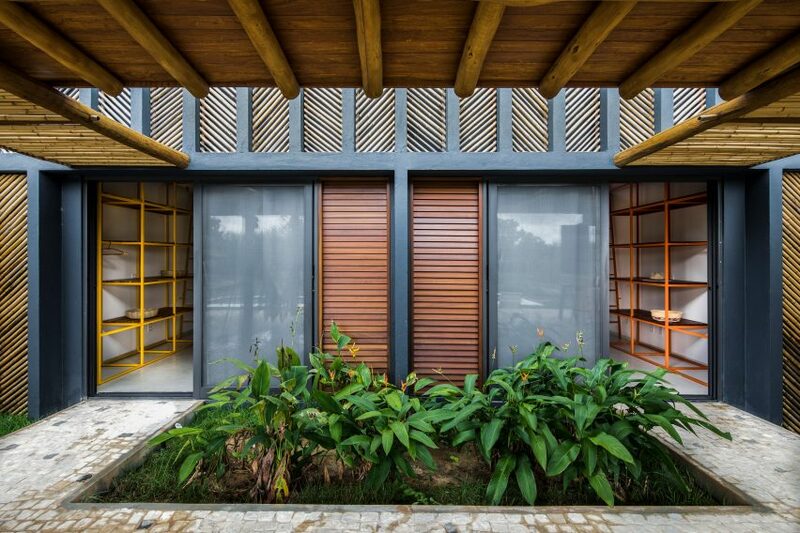 “The clients, a couple who spend most of the year sailing on a sailboat through the Mediterranean islands, asked us to design a house in a condominium near a small village of the northeast of Brazil,” said studio founders Mariana Vilela and Daniel F Flórez. Built in just ten months, the house comprises a basic concrete block frame, which is rendered black where exposed as vertical ribs. 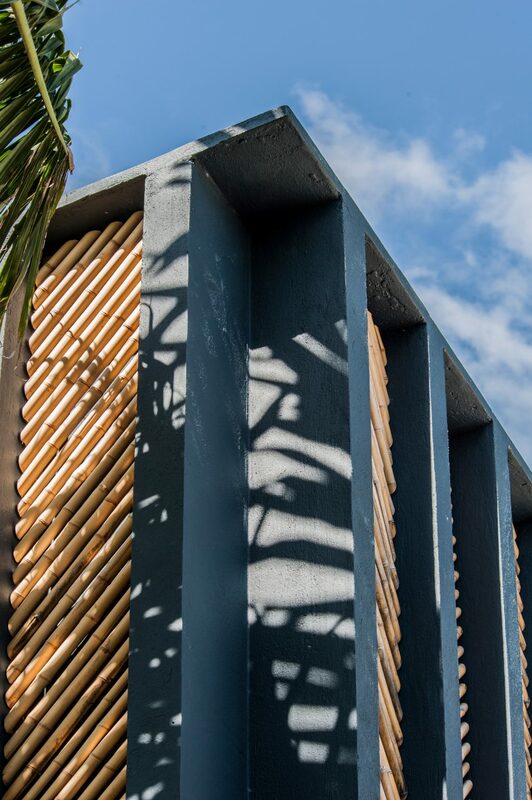 In between, bamboo sticks are arranged in a fishbone pattern to form panels, which shade the exterior facade and help with the thermal behaviour of the home. Inside are white walls and ceilings, further insulating the rooms. Within the bamboo-clad volume are three bedrooms with ensuites, lined up one after the other, and each with lofted spaces above their bathrooms. Every bedroom is accessed by sliding glass doors that join the main living area, which is outside. A traditional Portuguese sidewalk with mosaic stones forms the base of the patio. Sturdy pillars made of treated eucalyptus support a wooden canopy overhead. Two free-standing masonry walls on either side of the home are built with local stones, and add even more privacy to the outdoor patio. The terrace includes a large sitting area with various places for lounging, including a hammock and two rattan Papasan chairs. An outdoor kitchen with a U-shaped orange counter and a dining area with red table and chairs complete the space. Stepping down from the patio is a grassy patch of yard that surrounds a swimming pool. A natural material palette guides the design both outside and indoors, with wood, bamboo and stone found throughout. 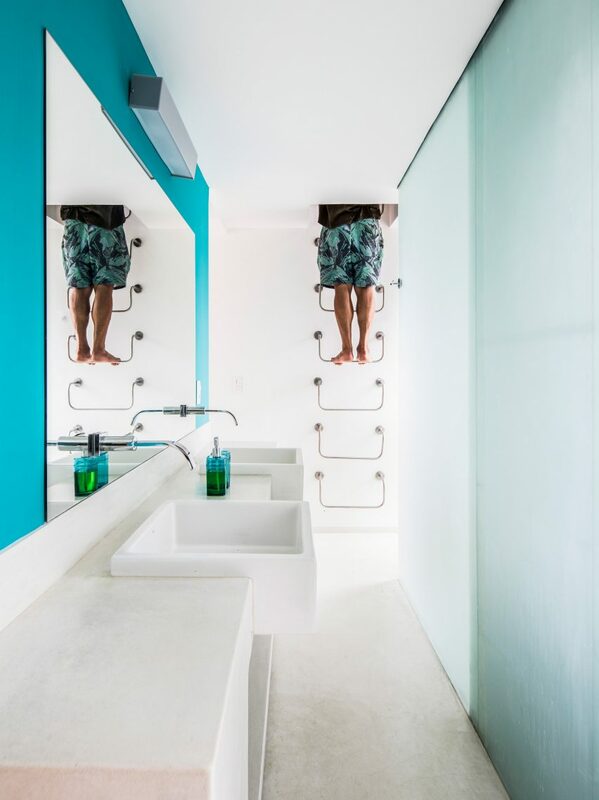 One of the bathrooms is painted varying shades of blue, relating to the client’s many boat trips in the Mediterranean. Another bedroom features a shelving unit across one wall, the top which is reached by a ladder that also provides access to the nook above the bathroom. 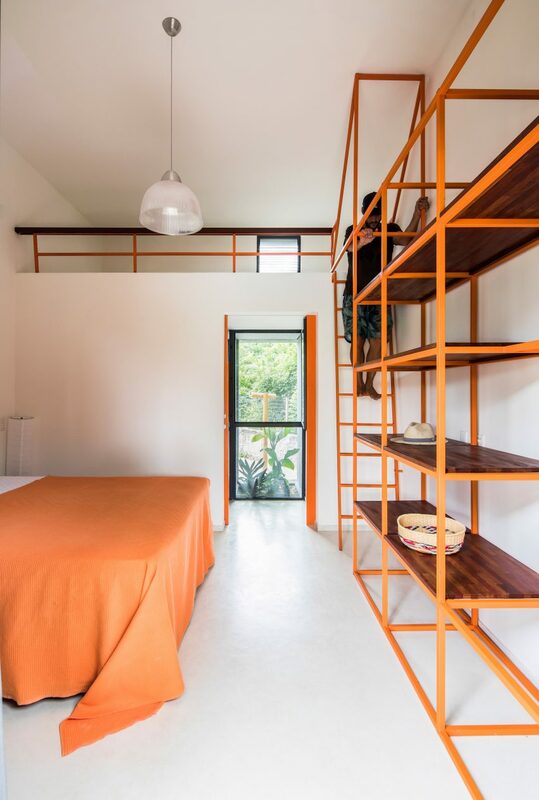 The frame for the shelves, the ladder and the railing above are all coloured orange, contrasting with the otherwise white surfaces. This design is mirrored in the adjacent bedroom, but with yellow accents instead. 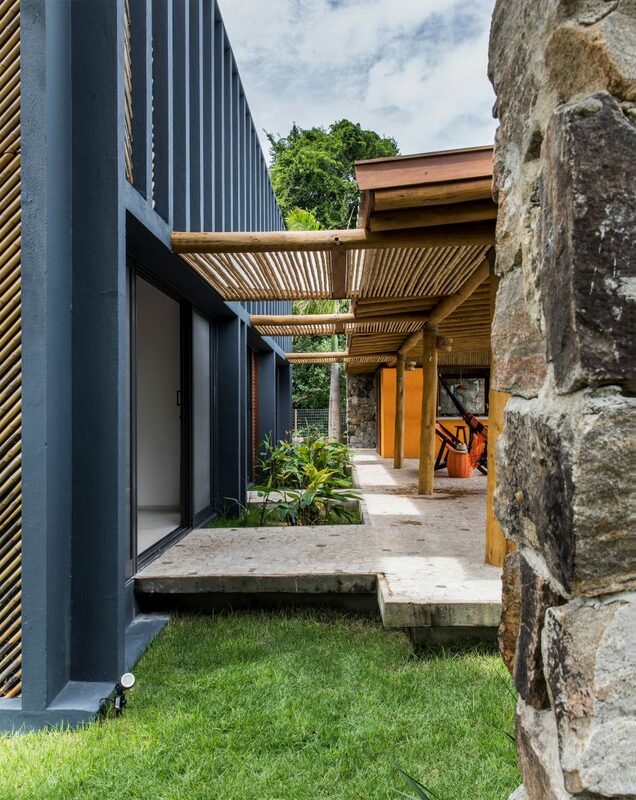 Other Brazilian houses with similarly rustic details include a residence with an expansive grassy roof by Studio MK27 and a two-storey home with shuttered bedrooms atop pilotis by Perkins+Will. Photography is by Maira Acayaba unless stated otherwise.